Earlier this year I ran my very first 5k on the 4th of July. I didn't have any real expectations because I hadn't ran one before and I had no idea what to expect. I was told they were brutal. I knew I would be running hard for 3.1 miles, but beyond that I was pretty clueless. I ran hard right from the start and crashed at the end. I finished just under 24:00. I actually enjoyed the race though and new I wanted to give it another shot. I ran my second 5k in August and finished almost a minute faster at 23:01. At the end of September I finished my third 5k in 22:19. Obviously I was really excited to have finished each 5k faster than the last. I never really thought I would enjoy running 5k's. For some reason I had the mentality that if I was going to sign up for a race it should be a longer one. Thankfully I decided to give the 5k thing a shot. I think it's becoming one of my favorite distances to race (not just because of the improved times…although I'm sure that has a lot to do with it). Thanksgiving day I ran my 4th 5k of the year. I was super excited for this race because it was going to be my first Turkey Trot and I was planning to meet up with Stephanie before the race. 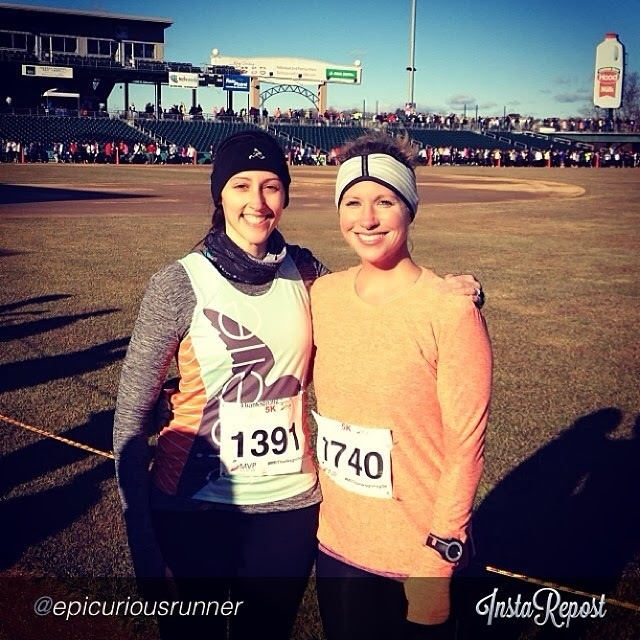 I met Stephanie at her dad's crossfit gym where they were staying warm before the start of the race. It was around 25 degrees that day and super windy. We weren't exactly excited about that, but we hoped it would help us run faster. The race started at 9, so about 15 minutes before the start we jogged over to stadium to line up. I warmed up a little on the jog over, but was pretty cold again by the time the race started. Stephanie and I talked about what I goals were. I was hoping to PR, but I knew I wouldn't be too upset if I didn't given the conditions. My legs felt cold for the first mile to mile and a half. I kept looking down at my watch and seeing numbers around 7:20-7:25. I felt like I could run faster, but my cold legs had other plans. Finally I started to warm up and settle in to a good pace. I could feel myself getting faster as the race went on and started to believe maybe I could PR again. When I saw the stadium I gave it my all to the finish. We finished inside the stadium and ran the last .1 around the warning track in the outfield. My feel felt like they were sliding all over the place and I felt like I instantly slowed down once I got in to the stadium. I tried to keep running as fast as I could and crossed the finish line knowing it would be close. 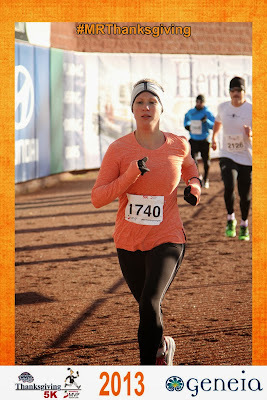 free race pictures?! hell yeah! I crossed the finish at 22:04. A new PR. I was super excited. I was even more excited when I looked at my splits and saw that my last, and fastest mile, was 6:58. I couldn't believe it. Never in a million years would I have thought I'd be able to run a mile under 7min. It's been so much fun this year seeing all of my hard work paying off. I'm usually pretty good at doubting my abilities. So, it's been a surprise to me to see how much my 5k times have improved this year. I really think I have more to give too, thanks to my amazing coach. Oh, and the best part? Stephanie got herself a brand new PR too! It was so much fun meeting her and I am looking forward to running again when she's back in NH for Christmas. told to "do something crazy" and this is what you get. fail. Up next? 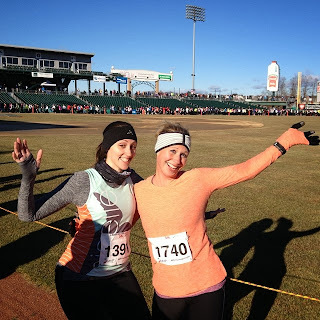 Jingle Bell Half Marathon on December 14th. Fingers crossed it's not as cold and windy as it was on Thanksgiving! I love this!! It's always nice when you surprise yourself. :) And seriously awesome to meet you, can't wait to meet up again! Congrats again on your PR!